On the Hong Kong-to-Singapore leg of my SQ1 flight from San Francisco, a B777 aircraft, an air steward noticed my iPhone connected to the in-seat USB port. He then told me I couldn't charge my iPhone this way. It seems it's not a question of not enough juice in that port but because the USB port does not have a circuit breaker and will keep charging even when the battery is full. Apparently it may overload the circuits or something. I disconnected my iPhone from the USB port. This is new to me. I have seen many people use it, myself included, without being told off. 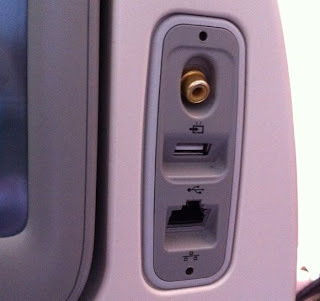 It seems strange to me that you would design a plane with a USB port that cannot do what normal USB ports on computers do. Anyways, I just switched to charging via the in-seat power socket (good thing I had my iPhone charger head with me). So these SQ USB ports, are they only good for flash drives? Strangely, their Krisworld magazine touts connecting your iPhone to the Krisworld system to access your own movies and music via the in-seat screen and the connection method? The USB port. They did have an asterisk on the iPhone bit that stated "On Selected Aircraft Only". So maybe my B777 was not one of the "Selected Aircraft". Maybe Singapore Airlines can go to Sim Lim Square and pick up new USB ports for these planes. I heard got offer. He is a typical singaporean, comprain and comprain. Or should i say giving his feedback or positive critism? Ya lor Brown has nothing to blog and so take issue with SIA. "When in Rome do what the Romans do". Simple don't compare with other carriers.If you fly American carriers, would Mr Brown voice his comments? Uniquely Stinkaporeans never follow instructions only give orders without the WORDS "PLEASE" & "THANK YOU". I mean the majority!!! Simple Mr Brown just boycott the airline which I had done long time ago. Think about it, if the usb port really didnt have a circuit breaker, wouldn't it be a hazard? All electrical components onboard have circuit breakers believe or not. the reason given by the steward was told to him by a senior crew who didn't know any better. Mr Brown was right la,admit it SIA cabin crew.Don't believe ask BT loh. 1. If leaving your hp switched on during take off was so dangerous, wouldn't terrorists have just used that instead. 2. You can serve coffee and tea 30 000 feet in the air at 900km/h, but when taxiing on ground at 20km/h everyone has to strapped in like in a F1 car. I am sure you will try to survive even if there is only 0.001% chance of survival.